I had supper with Oli a couple of nights ago – he was visiting from Barcelona and staying with Rick and Su. They were out playing bridge, so we had the use of their kitchen. 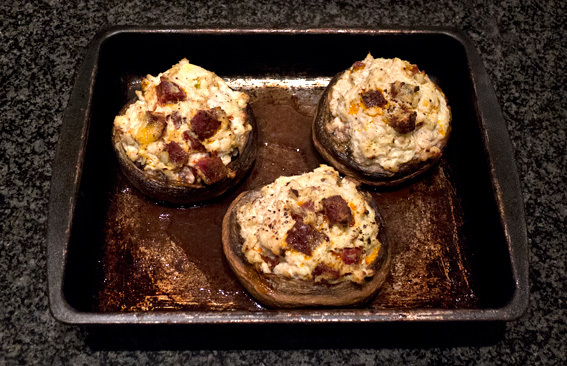 As a starter we stuffed portobello mushrooms with a mixture of Chorizo de Bellota, a teaspoonful of Garam masala, garlic, chopped onion, poached smoked haddock, ricotta and a little salt and pepper. 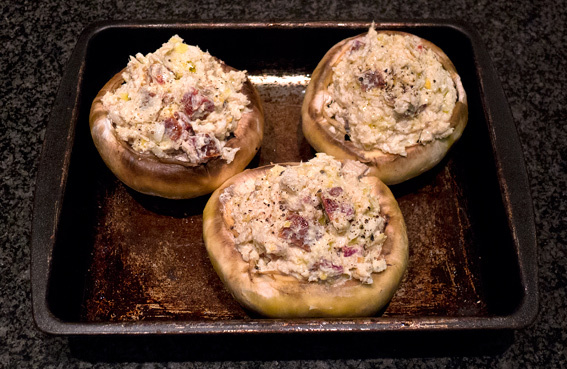 I rubbed the mushrooms with olive oil before stuffing and they were baked in a preheated oven at 200º C for about 20 minutes (until the stuffing was going a little brown and crispy). 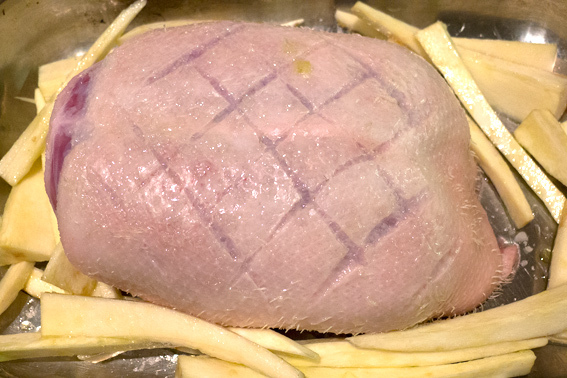 For our main course we cooked a duck crown surrounded by parsnip chips for about 40 minutes in a preheated oven at 200º C. Ideally duck should be underdone and slightly pink when cooked. 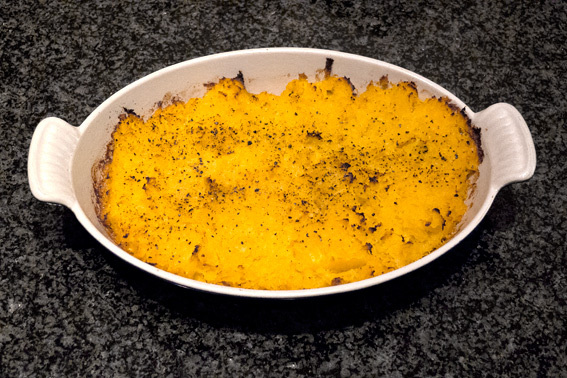 We had some boiled and mashed swede, baked in the oven with salt, pepper and olive oil to go with the duck. Supper was excellent – somehow we managed to polish off 4 bottles of wine, two bottles of New Zealand white (one of which was a Sauvignon grape), a bottle of Côtes du Rhône Rosé and I can’t for the life of me remember the red, but it could have been another Burgundy (hiccup). No room for pudding! This entry was posted in Drink, Eating Out, Fish, Food, Meat, Recipes and tagged Burgundy, Côtes du Rhône, Chorizo de Bellota, duck, Garam Masala, parsnips, portobello mushrooms, ricotta, smoked haddock, swede. Bookmark the permalink. Aside from travelling across the pond, how does one become one of your dinner guests? Am feeling very sad looking at this as you have now triggered my parsnip craving again! Everything looks wonderful and you drank my favourite wine (NZ Sauvignon). 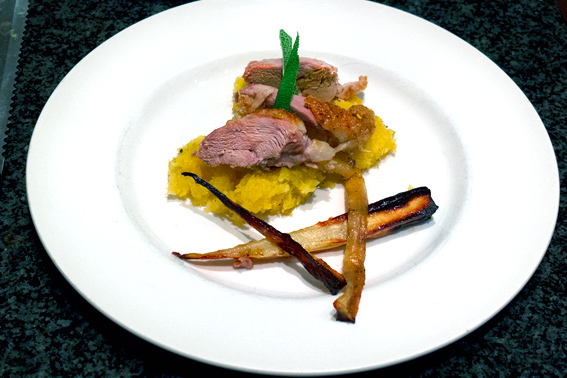 The duck looks cooked to perfection but I do hope you put a few more parsnips on your plate after taking the photo! Oi! Wot you two blokes doing in my kitchen?? Those mushrooms are drool worthy! Thanks – we made up the ingredients! A fine looking meal even if you had to cut your portions down to share. As far as I remember, which is not always accurate in the circumstance, the final red was Brancott Estate Pinot Noir from Marlborough. I’d always go for the Kiwi Pinots over a Burgundy unless you’re spending a fortune.